To celebrate 15 years in business, I’m making a quilt ~ and setting aside the 15th day of each month to work on the 15th Anniversary Whimzie Quiltz BOM commemorative project. Speaking of traditions, since it is the 15th of the month, that means it’s time to work on my 15th anniversary quilt. 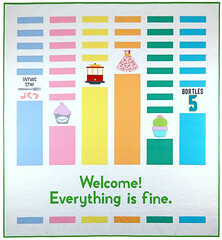 March’s block is this super cute pencil (a very handy quilting tool, if not the most obvious.) The pencil is part of the original Sewology block of the month pattern that was my inspiration, but I added my company name in machine appliqué below. Three months in, I’m still loving how this quilt is coming along. What I am finding, though, is that making small changes to a block of the month pattern can snowball! 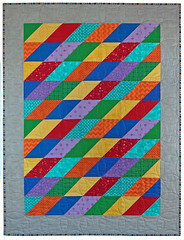 I really hope you’re enjoying taking the 15th Anniversary Whimzie Quilt journey with me. And remember, there’s still plenty of days each month when I can be working on a super special quilt for you, too! What do you want to celebrate in 2019? I really try for exceptional customer service at Whimzie Quiltz. Not just with the extreme care and attention I put into designing and making custom quilts, but by going a little further / trying to do a little more to make your WQ experience extra special. Part of that is surprising customers with a “gift with purchase” – an additional quilted item that often complements their custom quilt order. Sometimes, though, especially with returning Whimzie Quiltz customers, I struggle to find the perfect gift with purchase. I’d already made a toddler quilt for Jodi S. and included a quilted dinosaur checkerboard game for her little boy. Next she asked me to make a custom memory quilt for her husband (you may remember, he’s the one who had a lot of his high school and college diving memorabilia stolen and the quilt was the perfect solution for keeping what he had left safe.) Since her husband is in the Army, they move a lot, so a large pillow sham or something else that would be difficult to pack was off the table. Thinking of her being on the move all the time finally triggered the perfect idea ~ one of my quilted backpacks! I found a great Army-themed embroidery over at SWAK Embroidery – it’s a Army star parachute with the sentiment “Home is where the army send us”. I appliquéd it on a background of camouflage fabric (the same fabric that lines the backpack) and added it to the charcoal fabric flap. For the backpack itself I used a coordinating khaki fabric and finished everything off with camo straps. May I just say how much I love the backpack??? Holy cow! … We will use it often and appreciate everything you do! While I knew I wanted to make a quilt for my 15th anniversary, I wasn’t initially sure what I wanted that quilt to look like. My logo as an over-sized scrappy pattern? A quilt that incorporated fabric scraps from all the quilts I’ve made over the years? Nothing was really clicking until I stumbled across Sewology Block of the Month by Pen and Paper Patterns. As they write in the description, “Sewology … celebrates all things sewing” ~ which sure seemed the perfect fit for what I wanted to accomplish. 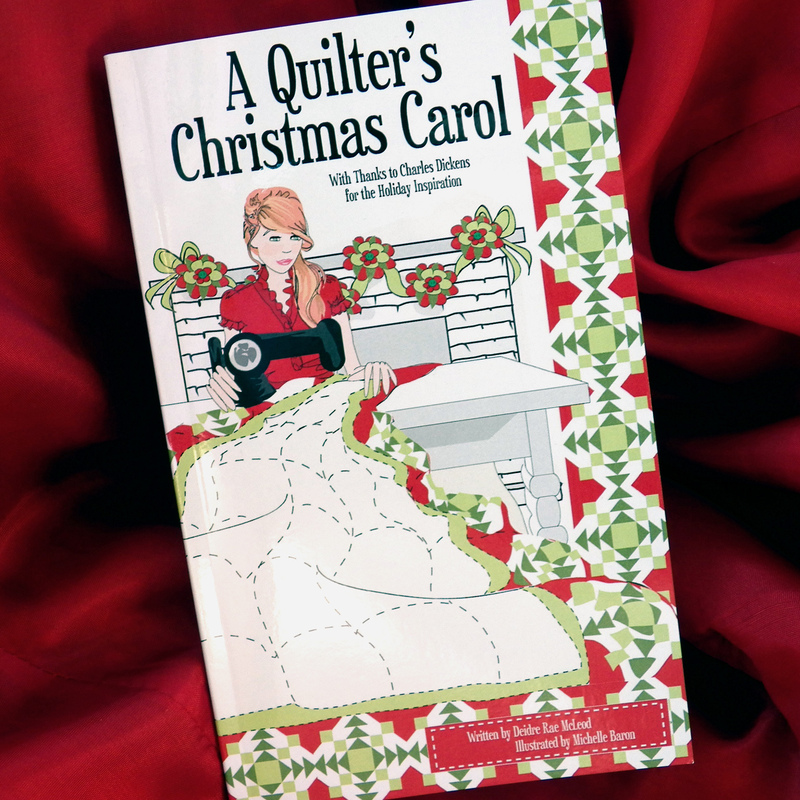 And their design, with all it’s different sewing-themed elements, is just so darn cute! So I chose their pattern as my main inspiration, though I’ll be throwing in a few elements that are specifically Whimzie Quiltz (like last month’s logo). So far, I’m loving choosing all the pink, orange and gray fabrics for these blocks – the mix is turning out happy, bright and delightfully celebratory. The pattern itself is clear and easy to read (yet adjustable when I need it to be, too) and the amount of sewing each month is fitting perfectly into my schedule. The only thing I didn’t realize when I chose this design is how much fun making the quilt would be. Today’s section is done and I’m already super excited for March 15th to roll around so I can work on another block… see you next month! I am a sucker for a sad story. Every time I make a t-shirt quilt, I swear up, down and sideways that it will the last t-shirt quilt I ever make. And then someone asks me to reconsider, explaining why having a t-shirt quilt made would be so meaningful to them and, gosh darn it, they always find a reason to make me change my mind! Tyler’s justification was especially compelling – during one of the many moves he’s had to make as an Army soldier, someone stole all the diving medals he’d earned over the years. All that was left from those times were his diving t-shirts and he and his wife wanted to make sure they were carefully preserved. How could I not help them out? There really is an “army blanket”. Sure, I’ve heard people talk about Army blankets before, but I assumed that generically applied to any blanket that someone in the Army used. Nope. There is an actual Army blanket given to each West Point cadet – it’s a gorgeous grey wool with black and gold accent stripes. We used that pattern as the overall design to pull all the t-shirts together. A good pun is a good pun no matter how often it comes up. 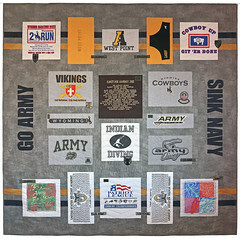 Tyler asked for the Army diving team’s rally cry “GO ARMY SINK NAVY” on the quilt. Every single time I saw it while quilting, which over the course of several months amounted to a 4,938,726 times (give or take), I giggled. There’s a first time for everything. This quilt is going down in Whimzie Quiltz history as the first, and dare I say only?, time I’ve been asked to quilt a Speedo. While the Go Army Sink Navy pun made me giggle, when I opened the package of shirts Tyler and Jodi sent and found a Speedo included I couldn’t stop laughing. I was literally the laughing / crying emoji 😂 for a good half hour. But I made it happen! Camouflage works. Of course, you always assume something like camouflage works. I mean the Army wouldn’t be making uniforms out of it since 1902 if it didn’t. But, boy, when your customer requests a grey camo for the backing fabric on their quilt, and you are trying to find loose thread ends on that fabric but can’t because they keep blending in too well that’s when you really internalize the concept of camouflage. Today is Support Your Local Quilt Shop Day! Since I can’t get out in person, I took a little virtual tour of fabric stores and found some new favorites. These quilt shops may not be local to me, but they are local to some very lucky quilters ~ and I hope each store has lots of IRL visitors today!